A condition for reinstatement of your driver's license or permit following suspension is your participation in an approved Illinois Graduate to Safety Remedial Education course. Drivers ages 15 to 24 who have received two violations within 24 months, or who received a violation under the Zero Tolerance Law, are required by the State of Illinois to complete the Graduate to Safety Remedial Education course. 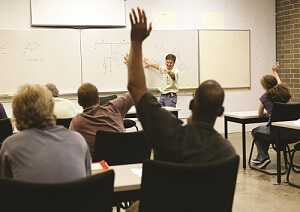 The National Safety Council Alive at 25 program (Illinois specific) has been approved by the Secretary of State Driver Services Department to meet the Graduate to Safety Remedial Education course requirements. Classes are available statewide and cost $90. National Safety Council is not responsible for drivers taking an incorrect class. Drivers will not be given a refund if the class has been completed. Please be sure you know exactly what class is required before you continue the registration process. Once registered, all fees are non-refundable. Do you have questions about the Illinois state-ordered Graduate to Safety Remedial Education course?